Ibiza Town, “Eivissa” in Catalan, is one of Europe’s oldest towns. Founded in 654 B.C. by the Carthaginians, it grew to an important fortress town and eventually became the capital of the Pituses (‘pine islands’), Ibiza and Formentera. Today more than 40,000 people live in Eivissa, that is roughly 1/3 of the whole island’s population. The old town Dalt Vila sits firmly above the rooftops of Eivissa, protected from pirates by seven bastions, unique, impregnable and still the soul of the town. At the highest point stands the cathedral, lit up at night and visible from far away. The fort was declared a UNESCO World Heritage Site in 1999. Antique walls surround a labyrinth of houses and narrow, winding alleyways. A small village in the middle of a city still today. Around 700 people live their Mediterranean life here: washing lines, chattering housewives, laughing children and everywhere this unique game of light and shadow. Every year the Medieval Festival and the Jazz Festival take place against this authentic backdrop. Culture vultures can also appreciate the Archaeological Museum and the Contemporary Art Museum. Since 1938 Eivissa is again governed from the fort, making the Town Hall a part of this Medieval quarter. Once, people lived inside the fortifications only. Then the white-washed houses grew beyond the gates, and formed the old town of today with its romantic flair. In front of the Fortress entrance is the charming Mercado Viejo, an Ibicencan vegetable market surrounded by cafés and pretty shops. The harbour area La Marina pulsates with streams of tourists and, at night-time, a wild party life. The entire old town is full of boutiques, souvenir stands and restaurants enticing visitors. People sit in bars, fascinated by the “beautiful people” of the night who pass by. Travesty and chic merge in the eccentric parades to present Ibiza’s famous nightclubs. The Boulevard Vara de Rey forms a glamorous border between the historical quarter and the modern district Eixample. Close to this hustle and bustle, at the Puig des Molins, an underground necropolis was discovered; an enormous graveyard of antiquity containing around 4,000 graves. It is the island’s most important site. Opposite the old town glistens the swanky yacht-harbour Marina Botafoch. Around 450 yachts bob around in the water in front of designer boutiques and gourmet restaurants. Prime positions with priceless views – especially when there are fireworks during city holidays. A small ferry links the Paseo Marítimo and its yacht harbours with the old port of Ibiza city, at the foot of Dalt Vila. In the exclusive district behind Marina Botafoch one can visit the legendary Disco Pacha and Ibiza’s Casino which is located in the Ibiza Gran Hotel. 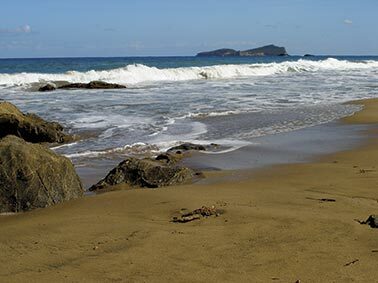 On the outskirts of Eivissa the town beaches bring much joy – Figueretes in the southwest and the calmer Talamanca in the northeast. Sant Josep is Ibiza’s largest district, where impressions are manifold and nature is breathtaking. 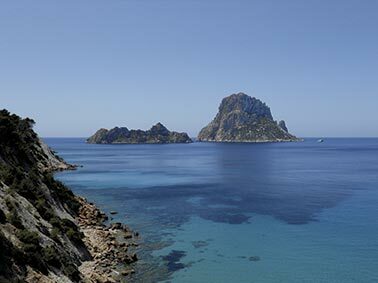 Myths and legends surround Es Vedrà, the gigantic rock in the southwest, which rises 385 metres above the sea. Boat tours go right up to the steep walls, which echo with the screeching of birds. Seen from Cala d’Hort, Es Vedrà appears daunting and even more spectacular from above the bay. There stands the “Pirate tower”, Es Savinar, built in the 18th century to report on approaching pirates. Ses Païses de Cala d’Hort, the archaeological excavation of a Roman-Punic settlement, is also of historical importance. The first stones were laid in the 5th century before Christ. From the Cap des Jueu, paths lead down to Sa Pedrera (Atlantis) – bizarre shore formations create the impression of sunken walls. But it is here where thick blocks were cut out of the rock, presumably to build the stronghold in Eivissa. It is easiest to get here by boat from Las Salinas or Sant Antoni. Following the coastline northbound, you can find delightful coves, touched by tourism, but charming all the same: Cala Vadella with its colourful fishermen’s huts, Cala Tarida with its beautiful beach, long and craggy with crystal clear waters. Shortly be-fore Sant Antoni, Cala Compte and Cala Bassa are popular beach destinations. Or how about a mountain hike? The village Sant Josep de Sa Talaia leans against Ibiza’s highest elevation, the plateau summit Sa Talaia, measuring 475 metres. A hike with stunning views. The markers begin in Sant Josep, which is also well worth seeing, especially the village square with its attractive fortified church. Ancient Ibiza awakens in Sant Agustí des Vedrà: weather-beaten walls, magnificent fincas, inns and galleries group together on a hill-top. The oldest village on the island, at least that’s what they say. A trip to Es Cubells is also worthwhile: from here you can see a wide panorama of ocean, rocky coast and tucked-away taverns which provide pure pleasure. 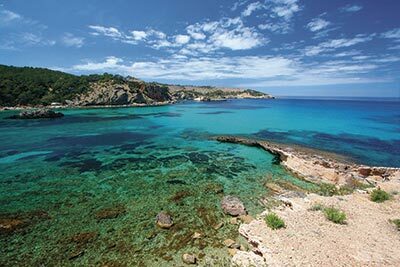 Further to the east lies Cala Jondal, where many a yacht is anchored, partly due to the exclusive beach restaurants. Those seeking peace and quiet love the red cliffs in the bay of Sa Caleta. This was the home of the first Phoenician settlers. The Poblat fenici, declared UNESCO World Heritage Site, still shows relics of the walls. At the most southern point of Ibiza, salt plains glisten and pink flamingos bend their necks. Ses Salines is a nature reserve and source of income at the same time. Salt stands for wealth, still today. A point proven at Salinas beach, which is frequented by the rich and famous. You can sit in beach bars amongst the dunes and people watch. Just next to it and comparably beautiful: Es Cavallet, with its nudist beach. Lots of action and parties can be found at the nearby Playa d’en Bossa, Ibiza’s newest and largest tourist centre. 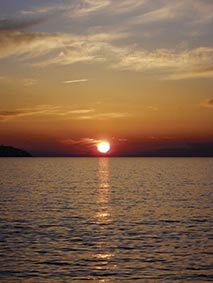 It was the Romans who discovered the bay of Sant Antoni – the deepest incision into Ibiza’s coastline, giving a wide view onto the western Mediterranean Sea. They called the place “Port Magnus”, great harbour, which is still discernible in the second part of the town’s name, “de Portmany”. Today hotels and tourist attractions line the shore, next to a long promenade for lengthy strolls. Towards the south lie the town beaches Arenal and Es Pouet. At the Punta des Moli stands a restored windmill which has been converted into a cultural centre with a museum. On the northern side of the bay a meeting place has been firmly established: people hang out at the Punta de ses Variades, in famous bars like the Café del Mar, and applaud the most beautiful sunsets on the island. 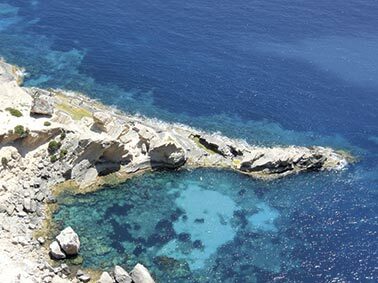 Further out of town, romantic rocky bays are tucked away – and the little Aquarium Cap Blanc, known as “Lobstercave” by the locals. In the past fishermen stored their catch here. Now the natural aquarium enchants visitors with light shows and classical music. Whoever seeks the „Egg of Colombus“ will find it in Sant Antoni: by the roundabout at the main entrance. It is the town’s landmark and inside its hollow core sits a model of the ship “Santa Maria”. The monument was erected in 1992 to commemorate the 500-year celebrations of the discovery of the Americas. Right behind it is the Plaça de ses Fonts, a pretty place to stroll with palm trees, fountains and street cafés. On the right-hand side you can reach the historical town-centre, where pedestrian streets lead to an old fortified church. Night owls appreciate the very British West End: bars and pubs, nightclubs and discos line the pavement, filling the streets with lights and beats. Behind Sant Antoni, in the direction of Santa Agnès, a sign points to Cova Santa Agnès. An underground chapel – for pre-Christian rituals – was found here containing Punic, Roman and Arabic relics. A further cave, well hidden, is near Cala Salada: the Cova de ses Fontanelles, where there are cave paintings. It is not yet confirmed but they may be traces of prehistoric hun-ters or Carthaginian watchtowers. Further in the North lies the original Ibiza, charming villages surrounded by impressive nature. 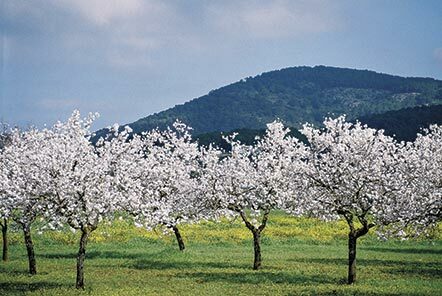 In February Santa Agnès de Corona is a sea of almond blossom. Hikers and mountain bikers like to tour around Sant Mateu. If you leave Sant Antoni to the South (towards Eivissa) you can find the pottery village Sant Rafel. It was deemed an “area of cultural value” by the island’s government. Rightly so, because the pottery produced here is amongst the prettiest of Ibiza’s souvenirs. Jagged steep coasts, deep blue water and thick pine forests – the landscapes that define the township of Sant Joan are wild and romantic. Tucked away behind a small chain of mountains lies the holiday town of Portinatx. Rocky shores flank the natural harbour, a lighthouse rises above the sea in black and white, while restaurant terraces provide enchanting views across the bay. From Portinatx a pretty ancillary road winds through the Serra de la Mala Costa, the “mountains of the bad coast.” An El dorado for hikers, often with fantastic vast views of the North of the island. This way you reach Sant Joan de Labritja, a place that exudes the charm of a mountain village nestled amongst hills and terraced fields, with a church made of natural stone amidst wild gardens. The winding road continues even more impressively towards Cala de Sant Vicent. Here the beach is fringed by sheer cliffs; the island Tagomago – a destination for boat trips – sits on the horizon in the sea. Above the bay is the Cova des Culleram, mysterious and shady, a cult site where the Carthaginians worshiped their goddess Tanit. Southbound along the coast lie dark sandy beaches with their own flair: the small coves of S’Aigua Blanca serve the nudists, and more mainstream is the holiday settlement Es Figueral. The road Sant Joan – Eivissa or “Road for Gourmets”, is famous for its culinary delights. Cosy taverns serve Ibicencan home cooking and comfy places for bon vivants. The island’s interior fascinates in other ways, farming is still cultivated traditionally here; often you see farmers in oldfashioned dress. In the middle of fields of red earth is Sant Llorenç de Balàfia. The elevated church square provides a beautiful view over the idyllic rural landscape, where white buildings and three towers stand out. They belong to Balàfia, a fortified village from the 16th century, today privately owned. The name is originally Arabic: Balafia means “there is water”. Orange and lemon groves line the road to Sant Miquel de Balansat. Above the luminous façades rises the village jewel: the fortified church, where folk dances are often performed. Sun seekers visit the Port de Sant Miquel, those interested in culture the Cova de Can Marçà. The dripstone cave with authentic trickles and waterfalls is said to be around 100.000 years old. Guided Tours accompanied by lights and music regularly take place. The view from the cave terrace to the island Murada surrounded by light turquoise water is spectacular. The nearby Cala Benirràs, where “God’s Finger” rises from the waves and sailing boats bob up and down, is a gorgeous setting for sunsets. On Sundays the drummers and fire artists meet here, young beach-goers dance in the evening light and celebrate Ibiza. An island where the like-minded gather. Santa Eulària greets visitors charmingly: the entrance is simply picturesque, past the church on the hill called Puig de Missa and the small Roman arched bridge. The Viaducto Romano crosses the bed of the Riu de Santa Eulària, the only river in the Pitiuses. The river flowed until the 20th century and brought wealth to the Arabs, who diverted this costly source with irrigation systems to the fields. This enabled farming on a large scale. Today the well-kept seaside town boasts a sea-front promenade. Passing lanterns, palm trees and flower beds you can stroll to the yachting harbour, with its chic, sunny drinking spots. Or in the opposite direction you can reach the estuary of the old river, which has now been filled with saltwater. In the centre of town one can indulge. The Passeig de S’Alamera is framed by shops and cafés, and in the Carrer Sant Vicent, it’s all about worldly pleasure which is why local residents jokingly refer to it as “munchies mile”. Above the modern town stands the origin of Santa Eulària, proud and lofty on the Puig de Missa. Indigenous farmhouses merge with the fortified church to make up a valuable piece of tradition, including also, in a restored finca, the Ethnological Museum. Here the Ibiza of yesterday is close enough to grasp: traditional costumes, household articles, furniture and an old oil mill which impressively shows how olive oil used to be obtained. Art lovers will appreciate the small Barrau-Museum with paintings by Laureà Barrau – an impressionist who lived in Ibiza at the beginning of the 20th century. Sports fans should take the back road to Eivissa. There shines the succulent green of the golf course in Roca Llisa, which has 25 holes. Before that on the left is Cala Llonga, a bathing cove with a wide beach. From here a boat tour is available: via Santa Eulària to the holiday-makers’ haven Es Canar, where there’s a large, weekly Hippy-Market. Niu Blau beach is appreciated for its tranquillity. 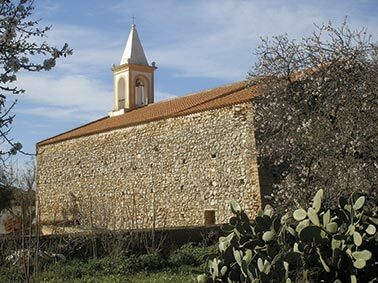 Further North, Sant Carles de Peralta is a village sitting amidst rural tranquillity. Just outside of the village you find the legendary Las Dalias, a venue for many parties and markets. Farming traditions from centuries ago are preserved in the Museum Es Trui de Can Andreu. From Sant Carles narrow roads also lead to many rocky bays, oases of peace and tranquillity, where you may even find yourself alone. Pou des Lleó, Cala Boix or Cala Mastella, all flaunt the charming old fishermen’s huts, called “Varaderos”. 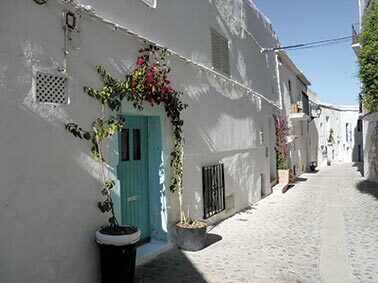 Santa Gertrudis de Fruitera, a pretty village in the middle of the island, also belongs to the Ajuntament of Santa Eulària. Traditional fruit orchards are cultivated in the surrounding countryside, as the name “de Fruitera” shows. The town centre with its many cafés and restaurants can seduce you to happily while away the hours. 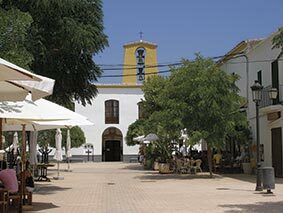 Lovers of culture also appreciate Santa Gertrudis for its auctions, art galleries and shops selling antiques and handicrafts.